The visitor centre sits at the entrance of our beautiful village and is open from mid May to September 7 days a week 9:00am to 5:00pm. 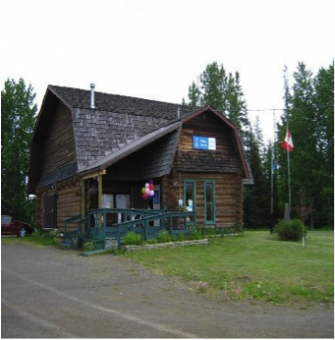 The visitor centre is also home to the Granisle Museum presenting local artifacts and history. A Mammoth discovery in June 1971 was made when a mining operation in Granisle stumbled upon a very significant grave. In fact it was a 34000-year-old bones of a COLUMBIA MAMMOTH, one of the largest mammoth species to have ever lived. Scientists and workers who attended the dig say several mammoths’ bones were unearthed, however the prohibitive cost of a full-scale excavation led to decision by the mining operations to rebury all but one mammoth skeleton. The mammoth skeleton is now housed at Canada’s National Museum of Natural Sciences. Replicas casts of the leg bones and a vertebra of the original are visible at Granisle’s Visitor Centre and Museum. The museum also has a large mining display with artifacts and fossils. The Crafter’s Hut is situated above the Granisle Visitor Centre/Museum, where you can find handmade crafts and sometimes baking by the residents of Granisle and area. The Crafter’s Hut is open for the summer season. Open from mid May to September 7 days a week 9:00am to 5:00pm.